This great little book provides a simple process project planning and management process that is easy to learn and easy to teach to your employees, fellow technicians, and sub-contractors. You’ll learn to track any project, explain all the stages to clients and employees, and verify that everything is completed on time and under budget. The authors show you a great technique for making sure that scope creep is a thing of the past! Make every project a successful and profitable project! This book jumps right into a down-and-dirty, get-it-done process for creating and implementing projects that work. The primary audience is the technical consultant. 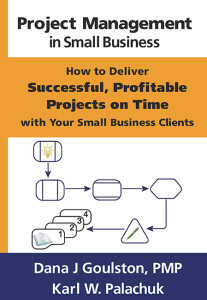 But this process, with very little fine-tuning, should work for just about any SMB project. Standard operating procedures will set you free! Having standardized forms and procedures can go a long way to improving your company’s success and profitability. Projects are simply the next step in that process.